I love dressing chickens up as other animals. I have dressed a chicken up as a duck and now I'm dressing it up as a pig! Essentially, all this means is that I am taking the fat of the animal and slathering it all over my chicken and roasting it. I am not sure if life gets much better than a roasted chicken slathered in fat. I mean, let's be serious. This recipe is so simple it will make your pretty little head spin. 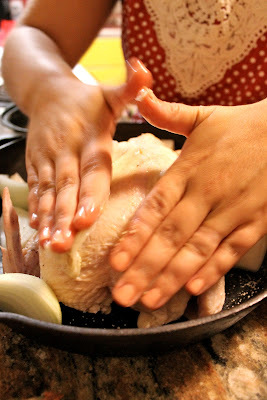 We're going to cook the bird in a cast iron skillet, which I have to say is one of my favorite ways to do it--and I have tried a lot of different ways. There is just something about the cast iron skillet that really does a bird justice. It should be said that you can use a roasting pan if you don't have a cast iron skillet. But if you don't, consider getting one to add to your collection--I am in love with mine! There are also just a few ingredients you need to make this recipe, which we can all agree adds incentive. The main ingredient you need (besides a chicken) is bacon fat. It's what dresses this chicken up like a pig. Bacon fat is something I regularly save to use. You can read more about that by clicking HERE. Let's get started, shall we? One onion, cut "rustically" which is my fancy-pants way of saying, "just however you feel like it, but not diced." I like big old chunks because they will cook up in the oven. And you have to have your fat. YUM. I rinsed my birdie, took out the gizzards and patted him dry. Then I placed him in my pan and he's ready to get dressed. I'm taking a few cloves of garlic, unpeeled, and stuffing them in the cavity of the bird. Salt and pepper him good. And now it's time to get your hands in the mix! Dip your fingers right in that fat and get a good handful or two. And rub the chicken all over! Don't leave any parts out. You want him fully dressed, after all. Then you are gonna pop this puppy in the oven on 400 degrees for about 45 minutes or until the internal temperature registers 160 degrees. I recommend measuring the temperature because it takes the guessing game out of the process. Bird with a crispy skin and a juicy center--it's the simple things in life, and this is one of them. 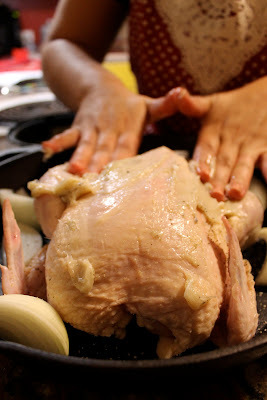 To prepare your roaster chicken, remove the giblets and discard (or save for use if you prefer). Rinse the chicken under cold water and pat dry with paper towels. I like to make sure my chicken is very dry--it helps the fat to stick. Place your chicken in your cast iron skillet. Chop your onion into chunky pieces and place them around the chicken. Place your cloves of garlic (unpeeled) into the cavity of the bird. Next, slather the bird with the bacon fat. Make sure to get in all the crevices and make it thick!! (See pictures above). Place the chicken in the preheated oven and cook about 40-45 minutes, or until the internal temperature registers 160 degrees.